Well, I’ve spent the afternoon making marinara sauce with whats left of the huge batch of tomatoes I bought the other day. Some of the tomatoes have gotten a little tender in spots, but I’ve only had to throw away two of them because of mold, and I’ve nearly used up the last of them all. I’m not making a full blown tomato sauce with them, but just processing them so that they’ll be more versatile down the road. What I’m making could be turned into tomato sauce later on, but it can also be used for a lot of other things, too. No salt yet, either. I can add that when I’m ready to cook again with them. This is one of the more foolproof canning projects, since tomatoes are so high in acid. This recipe makes about 5 pints, or 2 quarts of marinara. Bring a big pot of water to the boil. 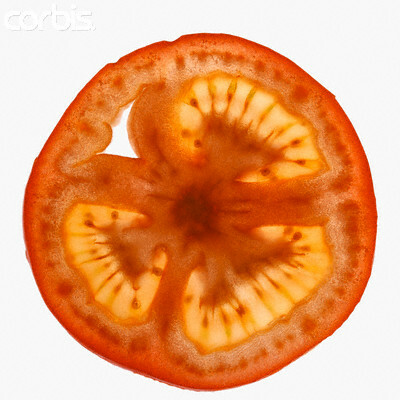 Cut an X in the bottom of each tomato, and dunk it in the boiling water for 30-60 seconds. Remove and immediately plunge into cold water. The skins should peel right off. In a heavy bottomed pot, heat up a couple tablespoons of olive oil, and add the chopped onion, and allow it to sweat, about 10 mins. Then add the pinch of red pepper flakes and garlic. Stir in the tomatoes, the water, and the vinegar. Cover, and let it come to a good boil, about 5 minutes. Remove the cover, stir, and lower the heat, and allow it to gently boil for 45 more minutes, stirring occasionally. 5 or 10 minutes before it’s done, stir in the basil leaves, and some more chopped garlic, if desired. This is a good starting point for your own homemade tomato sauce, but if you’re making multiple batches, like I am, follow the standard canning method — sterilized jars, lids, and tools. If you’ve been reading this blog all summer, I’m sure you know the drill by now. If you want to make a smoother sauce, you could run it through a food mill. In any case, fill the jars leaving a little head room. Put on the lids, then process the sealed jars in a hot water bath that covers the lids by at least 1 inch, and boil for 35 minutes for pint jars, 45 minutes for quart jars. Store in a cool, dark place, and use within a year. Be sure and examine anything you’ve canned for any signs of deterioration, or spoilage, and discard it if you find any. More canning info can be found at CanningUSA.com. A foodie blogger in the UK has manufactured a meme and came up with a list of 100 items for people to repost on their blogs to say what they’ve eaten, what they haven’t, and what they won’t. I managed to tick off 71 items, and only indicated 4½ items I wouldn’t ever touch : horse, roadkill, head cheese, a raw scotch bonnet pepper, and a fat cigar (which was listed with cognac, something I’m more than happy to drink). The Washington Post has a longish article on a local woman who is starting a small business venture producing her own pickles. It details a few recipes (spicy dill pickle spears, dilled green beans) as well as general tips on keeping your canning process sterile to avoid the possibility of foodborne illnesses. Lesson learned : When you see a recipe that looks good on a cooking show, write it down, because the corresponding recipe on the program’s website may be very different. Yesterday, I tried making a batch of Jamie Oliver’s homemade ketchup recipe, as he demonstrated on his episode on pickling and preserving, on Jamie at Home. The recipe I downloaded has you brown off a red onion with half a fennel bulb, a stalk of celery, then add freshly ground coriander, a couple of whole cloves, some ginger root, some garlic, a red chili, and the stems of a bunch of basil. Then you could mix up a pound of fresh tomatoes with a pound of canned crushed tomatoes (or use all fresh tomatoes), and a cup and a half of water. Simmer that for 45 minutes, add the leaves from the basil, whiz in a blender, strain, and then add sugar and vinegar, and simmer for a long time until it was reduced by half. I followed the recipe to the letter, and while the resulting ketchup was pretty good, I found it to be entirely too sweet, plus the purpose of reserving the basil leaves until the end was supposed to provide a punch of fresh flavor, but simmering it forever to reduce it to the proper consistency completely undoes that. Luckily, I had the episode saved on the DVR, and so I sat through the segment again, and the one he did on television ended up looking a lot redder than the stuff I ended up with. Also, he didn’t have the celery, used fennel seeds, didn’t add the water, used twice the amount of fresh tomatoes as the recipe on the web called for. He didn’t do the two step method, but added the vinegar and sugar during the first step. In a heavy bottom pan, sweat the chopped onion in olive oil to bring out their sweetness, for about 15 minutes. Grind (in a mortar and pestle, or a coffee grinder dedicated to grinding spices) the whole coriander, fennel, and cloves, and add it to the onions. Peel and chop the garlic and the ginger, and chop up the chili pepper, and add that. Cut the fresh tomatoes and remove the seeds and membrane (optional), and add to the pan. Add the passata/tomato puree, the basil stems (chopped) and stir in the vinegar and sugar. Bring to a boil and simmer for 30-45 minutes. Remove from heat and add the basil leaves. In a blender, working in batches, whiz it all until it’s a relatively smooth consistency. Force through a sieve or use a food mill to get a completely smooth and thick paste. Using sterilized bottles (either run through a hot, hot dishwasher; put in an 175° oven for 30 minutes, or boiled in water for 30 minutes), as well as a sterilized funnel and ladle, spoon in the mixture until nearly full. Put on the sterilized lids, and process in a hot water canning bath for 30 minutes. Uh-oh. I just went to the local farmer’s market, intending to buy some cherry tomatoes to make the homemade ketchup described on Jamie Oliver’s cooking show. I had originally picked up 2 pints of yellow plum tomatoes and two pints of yellow grape tomatoes, which would have set me back $11, but when I got to the head of the line, the farmer offered me an amazing deal. Since it was close to closing time, and he didn’t want to lug them back with him, he’d sell me a box of 30lbs of red Early Girl’s for $12. I couldn’t turn a deal like that down, and I put the yellow tomatoes back and walked off with the Early Girl’s. 40¢ a pound. So not only will I be making the ketchup, as well as a bunch of tomato sauce to can, I see a bunch of BLT’s in my future, too. I tried a recipe a few months back from Ellie Krieger, that involved zucchini, sliced very thin, and grilled on a grill pan, and then a dollop of goat cheese and a basil leaf was placed on each one, and rolled up. I thought they were delicious. The grilling of the zucchini, even for only a couple of minutes, was enough to provide a nice smoky flavor, and the creaminess of the goat cheese, paired with the jolt of the basil leaf. Unfortunately, my wife wasn’t as enamored as I was, and so I tried to come up with an alternative when I made dinner tonight. I was pretty good, but I think I need to figure out a way to cook the zucchini a little more. Preheat the oven to 375. Slice of the tail and the stem end of the zucchini, and peel the green skin. Slice it in half, lengthwise. With a melon baller (or a spoon) remove the seedy interior, so that it looks like a dugout canoe. Salt and drizzle with a little oil, and place in a baking pan. In a frying pan, sautee the onion and the potato until lightly golden, and set aside to cool. In a bowl, break up the goat cheese and mix it with the yogurt until creamy. Add the spices and the herbs. Mix in the cooled onion/potatos, and with a spoon, fill in the wells of the zucchini. Bake for 10 minutes, until heated through. “California Cold Process” – Real or Swindle? Your California cold process Is an out and out swindle; and the most shameful part of It Is, that various journals will accept this kind of advertisements and put them right In their reading-notices, without any caution or warning to their readers. I do not know whether the editors are stupid or Ignorant, or whether they are so lacking In conscience that they do not care how much their readers lose, providing they get the money for inserting the advertisement. Just one single point should be proof enough to anybody: This man Casey says he can put up a bushel of fruit In ten minutes. If this is true, why do men invest thousands of dollars In putting up expensive canning-factories for canning peaches, vegetables, and other produce, when for 18 two-cent stamps they could learn how to put up fruit so that It will keep a year without spoiling, at the rate of a bushel In ten minutes? 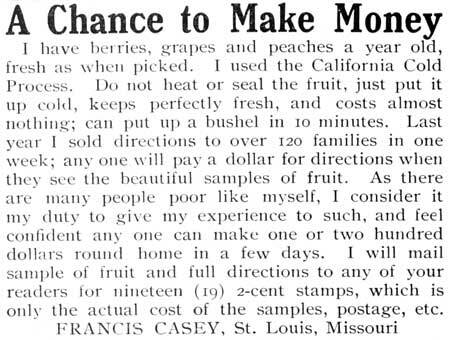 I do not know whether Francis Casey sends any samples of fruit or not. You can find out by investing 18 two-cent stamps. The thing was exposed years ago by the Rumi New Yorker and other periodicals. There is no process known for keeping fruit better than the ordinary well-known methods of canning. It is possible to put up sweet corn in your own home so it will keep; but it Is a difficult and laborious operation unless you have appropriate machinery. I know It would be a grand thing for each family to put up Its surplus stuff right at home; but the regular process by cauning Is the only safe and wholesome method. Rhubarb for pies, and some other garden products, may be kept In tolerable condition without heating, so I am told; but. If I am correct, It is an uncertain and risky business at the best. P. S. — I will send the stamps for thn process and give it to you all In next Issue, if I get any thing. Unfortunately, I haven’t been able to find any records of what the California Cold Process actually involves. I’ll keep looking, though. On my recent trip to visit family, we had lunch at a german restaurant called the Hofbrauhaus — as close to an authentic german beer garden as I’ve seen since my summer in Europe, 20 years ago. Over a lunch of grilled sausage, mashed potatoes, and sauerkraut, my father-in-law described a vivid memory from his youth, where his German grandfather would keep a piece of smoked eel wrapped in wax paper on the window sill. He told me that he hadn’t had it in years, but had scoured the authentic delicatessens in Cincinnati to no avail. He did say that he had managed to find some at a delicatessen here in Northern Virginia, upwards of 30 years ago, and he wondered if the place was still in business. I told him that I knew of one in the area that he was talking about, but wasn’t sure if it was the exact same place. I promised that I would stop in the next time I was in the neighborhood and see if they had any eel for sale. Well, I sort of forgot about it. Then I called him to talk about something else, and he said “you found it!” After I got over my confusion, he said he was sure I was calling him to tell him I had found some smoked eel for him. I decided that my priority project for the next day was to make a trip out to the German deli and confirm if it was even available. Sure enough, they had some — though it was from a Canadian company, in a vacuum sealed package, and frozen. I bought the two larger of the four pieced they had, put it all in an insulated envelope, picked up a slab of dry ice, and headed off to Fedex. Admitting that I was shipping something with dry ice was probably my first mistake. I couldn’t use their white overnight boxes, but had to purchase a box, and I paid a small fortune in shipping fees. It arrived the next day, and my father-in-law was thrilled. I sent him an email to find out how it was, and if it was everything he remembered. He reported that he recalled being able to flake it off to eat on a cracker, and what I sent was much firmer than he remembered, but that the smell, and the flavor was perfect. And now, he’s looking for more. So I did a little google searching to see what’s out there. Most companies that sell it are in the UK. Globe and Mail : “Serving up a slithery, dwindling delicacy,” a news story (6/17/07) about how the Canadian eel population is in decline, down 90% from 30 years ago. Brown & Forrest, U.K. 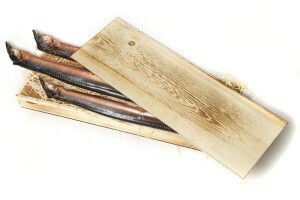 Purveyors of the smoked eel, salmon and other smoked foods. Ummera (Ireland) offers smoked silver eel and will lets you subscribe to a mailing list that will alert you when they have product to ship. I decided to do a search for the german name (Aal Filet geräuchert), and came up with a german company that appears to be willing to ship it. The site is in German, and the prices are given in euros. distavore n. To prove how wrong the farm-to-table movement is, I cooked a dinner purely of farm-to-airplane food. Nothing I made was grown within 3,000 miles of where I live in Los Angeles.…My distavore meal was more a smorgasbord than a smart fusion of cultures, but I still ate the way only a very rich person could have dined just 15 years ago. cuisine trail n. A plan to authorize more cuisine trails, including as many as 10 “apple trails” and 10 trails that could include several different foods and wines. The idea is to boost tourism and agriculture products. chop-up n. Mr. Albarn brought them as well into the revue, or the “chop-up,” as he called it—a Nigerian term for a feast. For more neologisms, and not just food related, visit The Double-Tongued Dictionary.